One of the many things I am so grateful for is that on the 9th of March 1976, the man destined to own half of my heart is born. Janne [a.k.a the boyfriend/Bebe] never fails to brighten my days. He fills my life with so much joy. He's my soulmate, my destiny, my dream come true... my Bebe. I love him with all I am and with my entire cheesiness as a bonus. Yayks! Because Bebe enjoys watching the famous Homer Simpson on telly [I do like Homer, too! 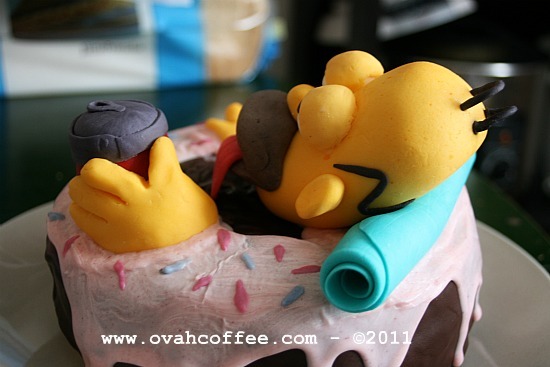 ], deciding on what the design of his cake will be hasn't been that difficult. The challenging part is the time constraint I have. 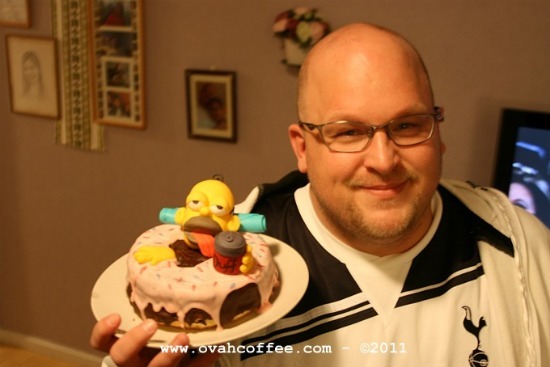 I really want to surprise Bebe with a Homer Simpson cake. Every part of the cake is created on the same day while Bebe's at work and I am so happy that I have managed to pull it through before he's come home. I am proud of this creation most especially because Bebe really loves it! 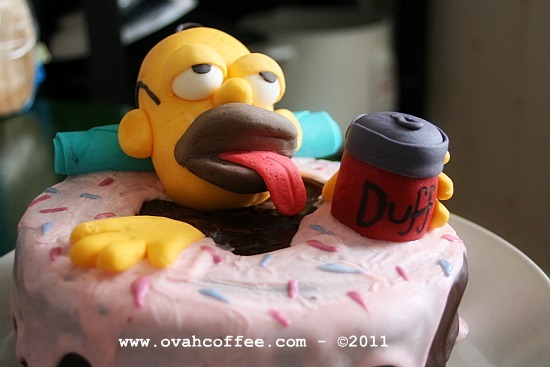 Anyway, Homer, the can of duff beer and the blue towel are all made of sugarpaste. The cake is of vanilla sponge cake filled and crumb coated with dark chocolate ganache. The donut icing is made of white chocolate, melted and tinted with the color pink.